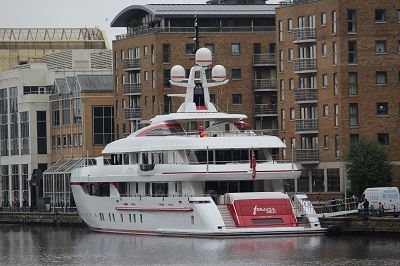 After a quiet period, there appears to be a bit more activity with ships visiting West India Dock, the latest arrival is the superyacht Forever One. 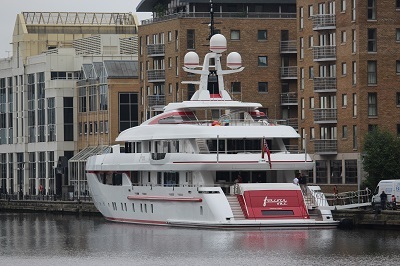 The 179 ft yacht was built by ISA yachts at the Ancona shipyard in Italy and launched in 2014. The yacht was designed by Horacio Bozzo Design with interior design by Studio Massari. 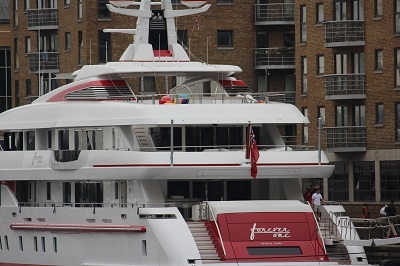 The yacht has a reverse bow and fold-down balconies with an unusual colour design on the exterior with red touches here and there. The red relates to the owners’ connection to Coca Cola. According to various sources, Bruce Grossman is the owner of the yacht Forever One, he is considered to be one of the richest men in Mexico. The name Forever One refers to Bruce’s wife Elsa. 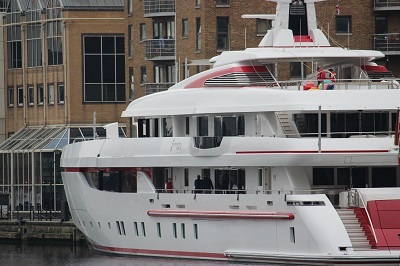 The yacht did visit the dock before in 2015, It is not known how long the Forever One will be in dock. By isleofdogslife in Dock Life on June 12, 2018 . Once again, many thanks for the information.